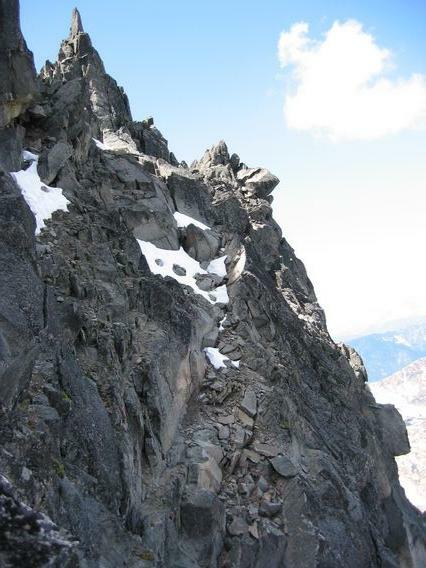 We had a grand plan: Climb the west ridge of Mt Stuart, and continue east to traverse the ridge and summit Sherpa, Argonaut, Colchuck, and Dragontail. This time of year, enough snow was up there that water would not be a problem. We could carry a minimal amount of bivy gear to minimize weight. Since the climbing is rated 5.7 or below, we could move quickly and solo or simul-climb most of the technical sections. That was the plan. 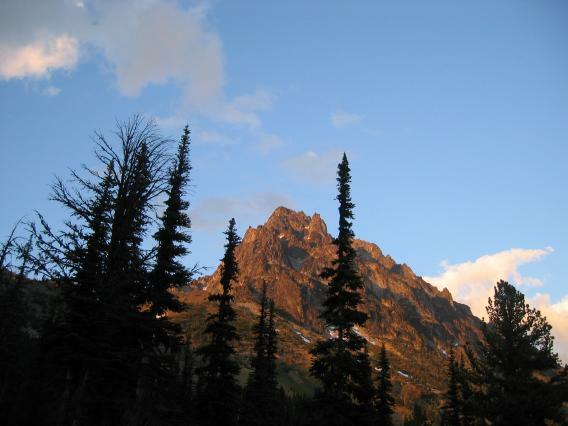 We left Seattle at midnight on Sunday and departed the Esmeralda trailhead towards Ingalls Peak at 2:22am. We hiked quickly and confidently past the first branch in the trail, waiting for the branch to Longs Pass. At the second trail intersection: "Uhh, which way?" Following the edict of never consulting the map until one is lost, we took a peek and discovered that we had gone down Esmerelda Basin instead of Ingalls Way. Instead of heading back 2+ miles and dropping down 1000 feet pretty much to the trailhead, we chose a shortcut -- a slightly rising traverse ENE to Ingalls Pass. The terrain looked open enough not to cause too much difficulty. Aside from sidehilling on ball-bearings for a few sections, the shortcut paid off. We rejoined blindingly obvious tracks toward Ingalls Lake and continued through Stuart Pass to the lower West Ridge. Gary hiking towards Ingalls Peak, Monday morning. 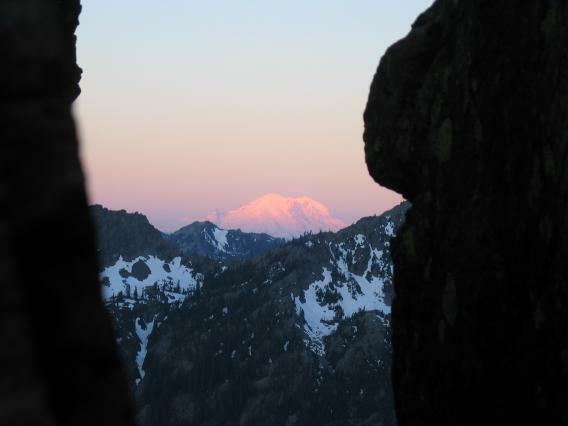 We soon enjoyed a view of Ingalls Peak to the north and a glowing Rainier to the south. Ania, shortly before reaching Ingalls Pass. Pleasant steep scrambling took us higher. At some point we decided to put on helmets, disobeying the edict of not putting on the helmet until the first rock comes down. "One of my two water bottles is missing. It was in the outside pocket and I must have forgotten to clip it to my packstrap. Good booty for someone -- it had a Neutrino biner on it." After a brief and futile glance to find the bottle, we continued up. The rock steepened. To the south, sandy ledges dropped slightly and traversed east. Toward the north, the terrain looked more interesting and enticing. Northward, ho! We finally reached a steep step that warranted a belay. 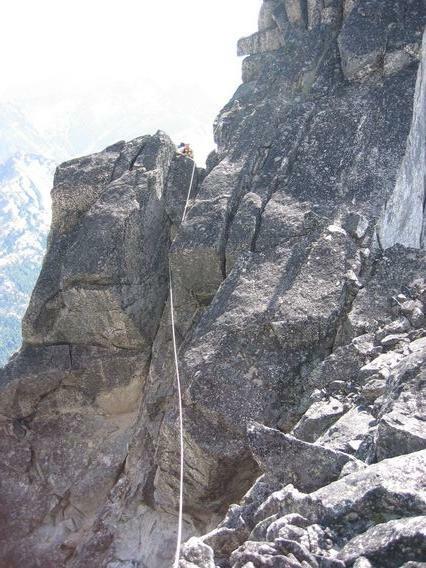 After some trundling, we each had a ledge barely suitable for putting on harnesses and readying the rope and rack. "You're swinging like a monkey!" The pitch eased off a little towards the top. Gary happily noted two vintage Chouinard biners, which upon closer inspection turned out to be "RECREATIONAL EQUIPMENT INC". Both are identical to the "LIBERTY USA 0" biner we found later. Gary starting to lead the first pitch, 5.9. Looking back at the easy ledges of pitch 2. Looking up at the latter half of pitch 3. 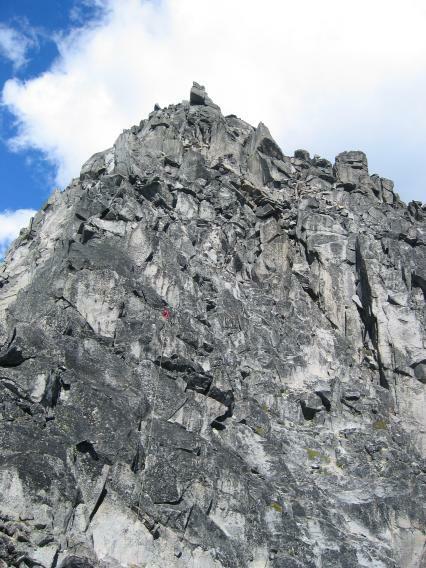 For our 3rd pitch, we simul-climbed directly up. 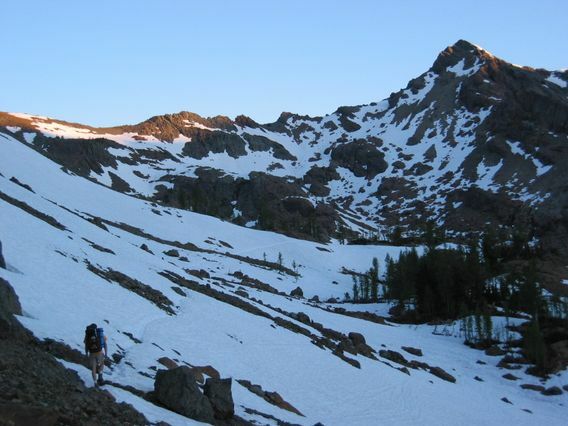 Nearing the top of the crest, a 50ft patch of steep snow lay along the most straightforward and direct path. So much for keeping feet dry all day. The snow was soft and rockshoes kicked good steps. Once past the crest, ropedrag was bad enough that the best "anchor" and "belay" was just to walk downhill on the sandy ledges on the less steep south side. Two fellows from Yakima -- the only people we saw during the entire trip -- were napping atop our 3rd pitch. Ania had briefly spoken to them near the first belay. They had stayed further right (south) and ascended more quickly on easier terrain (a.k.a. The Route). Without bivy gear and concerned about the time, they rapelled down as we continued up. A pretty view, seen from pitch 3. 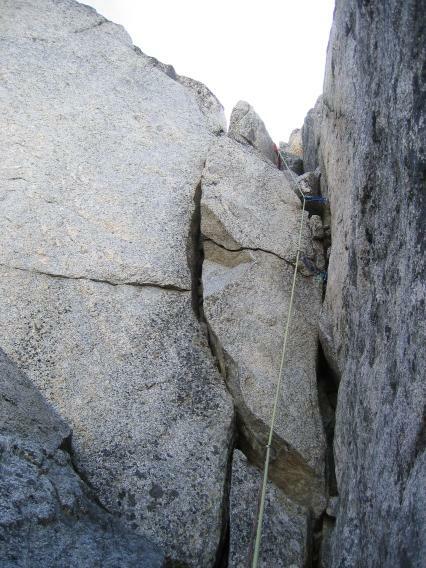 The 4th pitch was very short, due to rope drag. The 5th was a full 60m of 5.7 or 5.8, fun, zig-zaggy. To a large extent, though, many of our pitches are just a blur in the mind -- a testament to just how much rock we climbed. For that matter, counting pitches in the alpine is a somewhat arbitrary affair. Our pitches varied in length from 20m to 200m, and difficulty from 3rd class (it just wasn't worth the time to unrope) to 5.10a. Nonetheless, occasional sections stand out. Example: pitch 6, a.k.a. the belly-flop pitch. Piles of obelisks with the occasional chockstone littered the line of weakness to a crest. 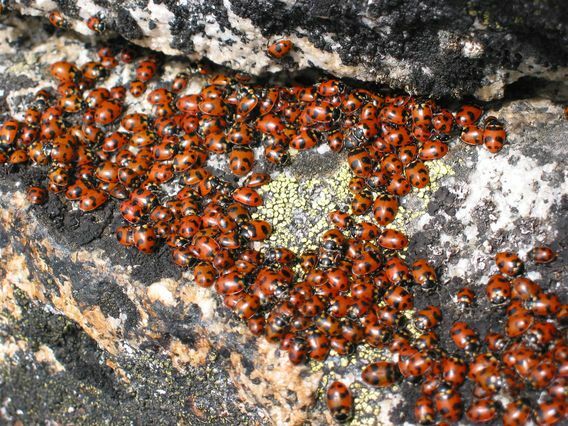 Jam, yard on a chockstone, squirm onto the ledge like a beached whale... why are mantles so hard with packs? Squeeze between a huge flake and the rest of the mountain. Another steep section, overhanging. Similar moves, and more beached-whale action. The crest took a left turn here and ropedrag potential did not look good. A short pitch, but a fun one. Looking forward at Ania about to place 1st piece. Pitch 7, seemingly short and easy, turned out to be long and easy. "Do I need to protect the downclimbing for you?" "Ok, this is ridiculous. I'm 40m out and haven't placed any pro. I'm going to put in a piece." Looking back at Gary belaying. The terrain appeared easier so for pitches 8 and 9 we short-roped and simuled. We initially stayed near the crest, enjoying gendarmes and exposed moves similar to the traverse pitch on Prusik's west ridge. Finally we dropped a little onto the south side. Sunset was approaching. It was evident to both of us that time to bivy had come. We were tired -- we'd been moving for the past sixteen hours. There was a lot to get done before bedtime. Gary fetched snow and melted water. 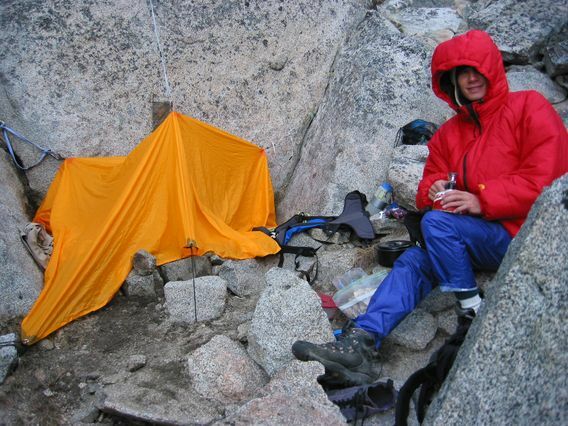 Ania dug with her ice axe to flatten out a bivy spot and hung the tarp as a tent. We ate, organized gear, and placed rocks on top of anything that might possibly blow away in the night. Aside from the grit in our macaroni from the melted snow, everything went quickly and smoothly. Minimalist bivies are a far cry from the comfort of home. Since we expected to be climbing with our packs, we opted to save weight. Neither of us had a sleeping bag. Ania used her backpack as a sleeping pad. A thin nylon sheet with tie-in points served as a tent. We slept in late, getting up at 7 AM. We needed the sleep and weren't really looking forward to climbing on cold rock. Within an hour, we were ascending again. Sandy ledges led south and around. 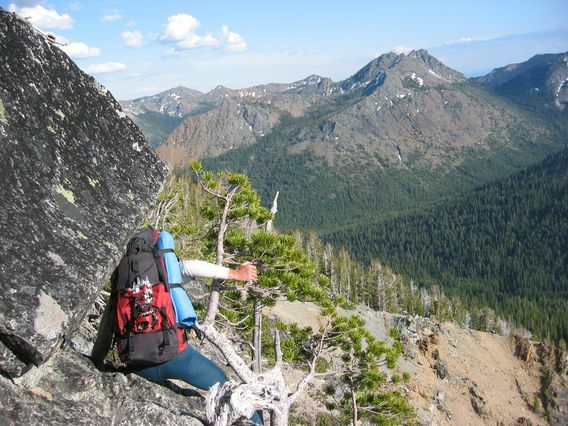 We chose rock along the crest and north face of the ridge, slightly more difficult and definitely more fun. 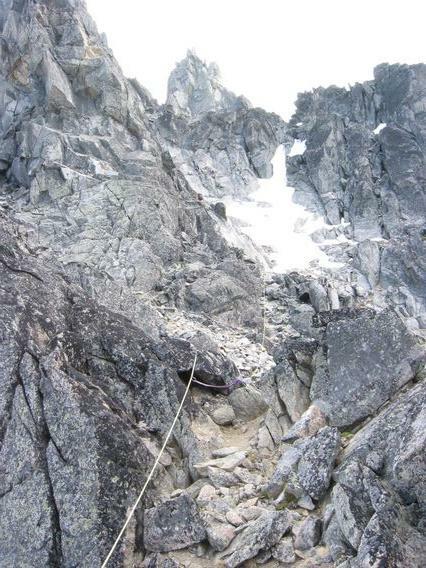 After a short unroped scramble, we tied in for 4 final pitches to the summit. Short 5.10a crack, pitch 3 on day 2. The 3rd pitch of the day included a short but difficult section, 5.9+ or 5.10a. We switched to belaying here. A large block lay between two faces, creating two undulating cracks. A mix of hand jams and chockstones for holds comprised our handholds. 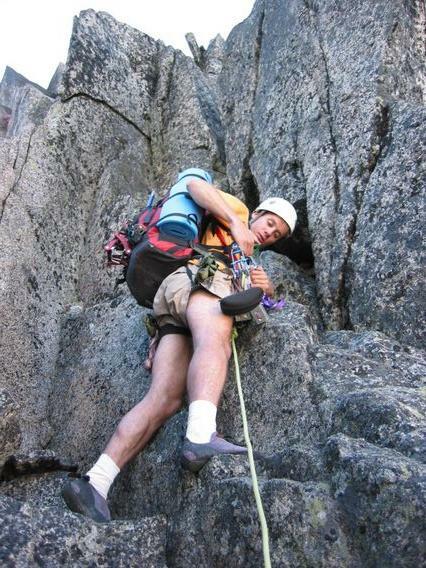 One of the difficulties of climbing in the alpine is that holds may be loose or shifty. Leader and follower gingerly tested each hold, one foot jammed in the crack, the other attempting to smear. We ended the 3rd pitch only about 20m shy of the summit, with only one moderately difficult move left for the final short pitch. With the follower out of sight, ending early seemed safer than risking an unintended simul-climb through the difficult section. We knew we weren't about to bag 4 more peaks to complete the intended traverse. Ignoring the guidebook and choosing harder climbing had made for more fun but also took more time. 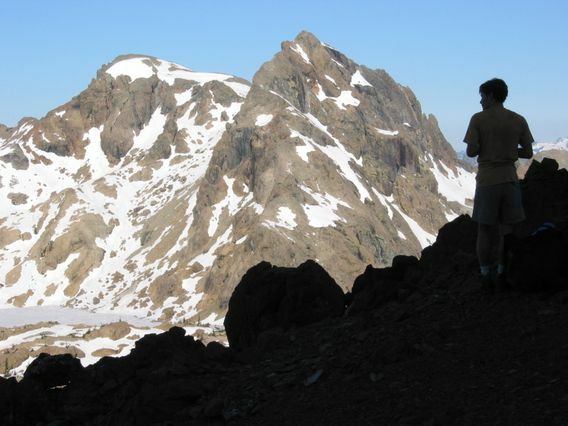 We took an hour to relax on the summit, enjoy the views, take summit photos, and examine the traverse. Next time, we'll do the north ridge. It's shorter. After a brief discussion of the merits of the Cascadian Couloir (easier, but one false summit away) versus Ulrich's Couloir (underfoot), we chose the direct route. We began plunge-stepping down the soft snow. One of us even demonstrated that self arrest does indeed put an end to unintentional slides. The pick fully buried in the snow and cut through like butter. Kicking the feet once slowed the slide to a halt. 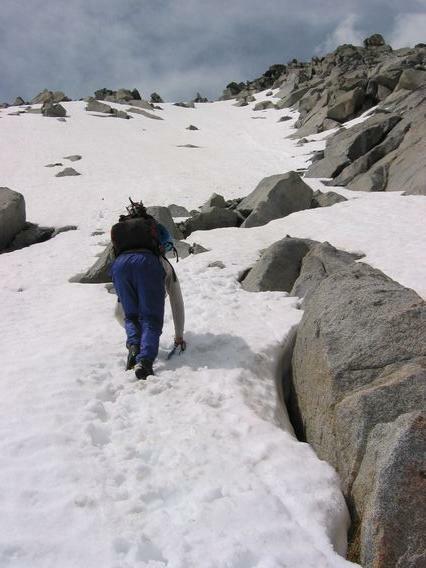 We alternated down-climbing snow in self-arrest position with plunge-stepping, depending on snow steepness and softness. Some distance down, the snow band narrowed and the raging stream beneath forced us to leave the couloir proper. We traversed along rock but found ourselves at the edge of a short cliff. "I was hoping not to do a rap on the descent. 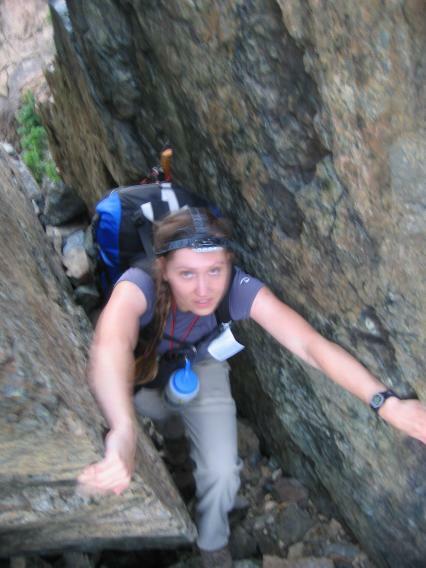 It would have been so cool to climb this much rock and not have to rappel." But alas. A sturdy horn of rock served as our 1st rap anchor. Descending snowy section of upper Ulrich's Couloir. "Look -- I found a water bottle!" "Does it have a name on it?" "Does it have a neutrino biner on it?" "Aaaggh, don't ruin it for me." We continued our descent. For speed and ease, we chose snow over chossy scramble where possible. As we descend, the snow narrowed and appeared weaker over the increasingly more powerful stream beneath, so more and more we stayed on rock. We got cliffed out again and rapped off a sturdy little tree. 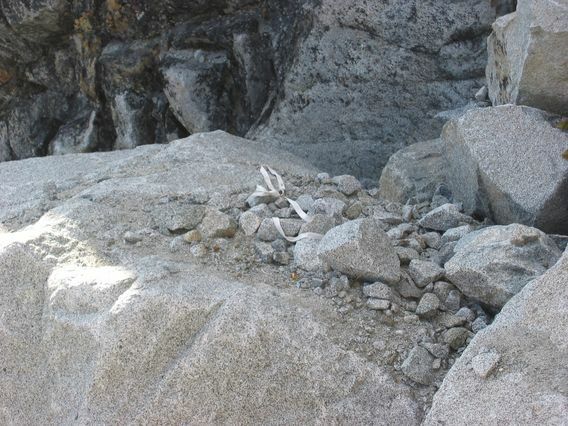 After yet another short section of down-climbing, we came across an eerie sight: an old white sling lying around a pile of broken rocks. We squirmed past a tree to the left and carefully downclimbed a steep 20ft wall. "This would be so much easier in rockshoes." "This would be so much easier without a pack." This put us atop another small cliff. This time a tree with bleached stiff rap slings greets us. "I don't trust any of these slings." "I don't either, but there's seven of them." "Rationally, that makes sense, but irrationally, it still makes me uncomfortable." Ania rapped first, with a fresh sling for backup. Armed with the empirical evidence, Gary saved the sling and rapped off the old webbing. Funny how climbers will risk so much just to save $2. Gary squeezing past a small tree, just prior to our 3rd and final rap. 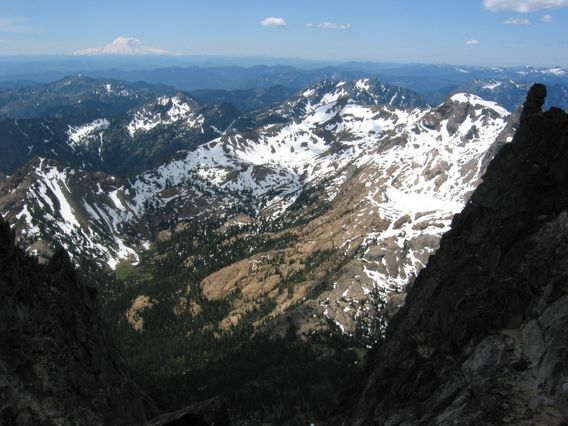 Straight down, the terrain was scree, and even worse, the occasional microwave block waiting to pounce. Although just a few hundred feet separated us from timber, the terrain was just too unpleasant and dangerous. Instead, we traversed and crossed the stream back to the west side of the couloir, onto better rock. Exposed broken ledges gave way to a short downclimb next to a tree and then easier terrain. 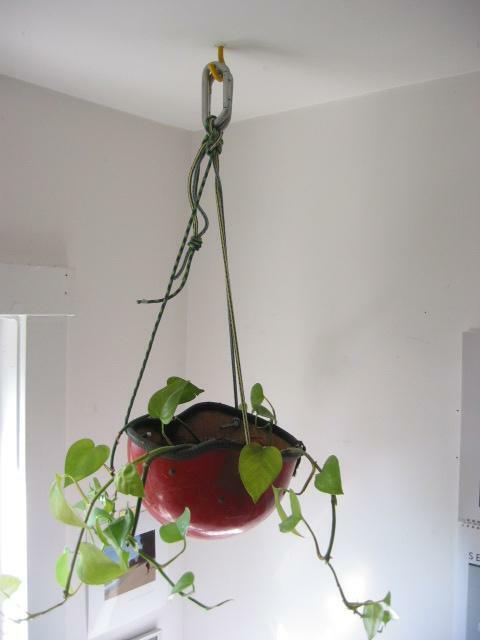 "I think I can use it as a flower pot." Free of any dings, the helmet must have fallen off of someone's pack. The helmet was dirty, filled with decomposing leaves and mud. We tossed it in a plastic bag and lashed it to the outside of a pack. The rest of the way down was uneventful. Timber led to meadows. We reached the creek, glad to have avoided brush. Out of water, we filtered more until the mosquitoes overcame our thirst. It was early evening, but we were on the excellent trail paralleling Ingalls Creek so things looked good. We headed west, occasionally glancing back at Stuart as its rock reddened. Mt Stuart turning pink in the light of the setting sun. "Hey, I think we've gone too far. Long's Pass is over there." The altimeter agreed that we'd gained too much altitude. A shortcut seemed in order. Instead of backtracking and dropping down to hit the turnoff, we cut directly west across meadows and scrambled up some rock to emerge on the east side of Ingalls Lake. We could have walked counterclockwise 3/4 of the way around the lake, or ascended steep slabs to go over the knob on east of the lake. We're climbers, not circlers, so up we went. It took us a few minutes, but we did find a section we could descend. It felt slightly tricky with the vanishing light and in our tired state. We saw some tracks roughly where the trail should be but they vanished shortly. We were tired. We'd been moving for 14 hours. Did we say we were tired? Apparently, too tired to think straight, or to pull out the map. One of us kept walking up, the other followed. On the map, unnoticed by us, the trail followed contour lines. For us, the terrain steepened. 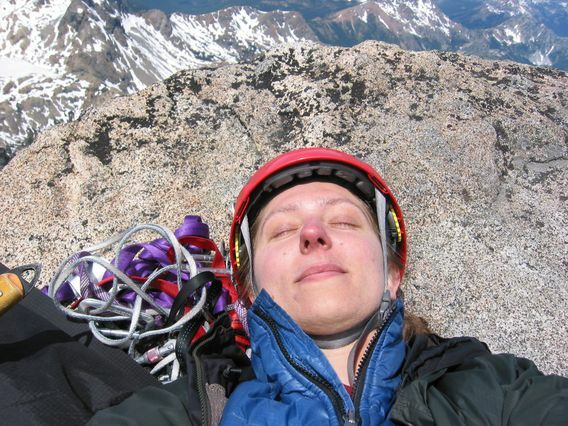 "I'm too tired to climb that slab in the dark safely." We finally descended, by moonlight and headlamps. Two hours later and not much closer to the car, we saw a trail. Excited, we started to follow it. "Hold on. Are you sure we should be going this way?" "But why is the trail dropping? And shouldn't it be heading in that direction?" We pulled out the map. Yes, we were on a trail, but not one on our map. It was too dark to see the peaks clearly enough to identify them. We couldn't figure out our exact location and we didn't know where the trail went. Finally, we decided to bivy. "I can't seem to find a spot flat enough." "There's nothing nearby to rig the tarp." "What about here? It's not that flat though." "I don't think I care any more." Ahh, another minimalist bivy. I had wanted to find out how it would be to spend a night out with just the extra warm clothes I bring along on longer day hikes. But I didn't want to find out TWO nights in a row! We put on all our clothes; filtered water; drank water; ate. We set up the tarp; hid things from the snaffles; tried to sleep. An arm propped here to keep from sliding or rolling over. A sore hip there. "Oh, yeah. I didn't notice until you asked me." Shivering can keep you from getting colder for a long time, apparently. And Ania ought to replace her puffy jacket with a newer puffier one. Eventually the skies brightened. We could see. Two hundred feet of walking put us on the right trail. Two hours later we were back at the car. There's no better feeling than getting the tired wet feet out of the boots. Wait, there is. Stretching. We drove back talking about trip. 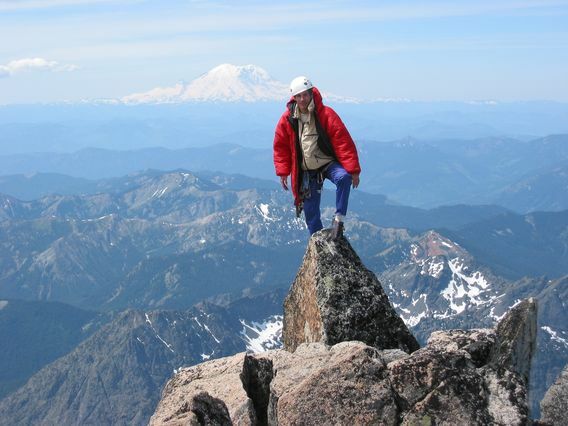 We consider it a success, though we didn't accomplish our original plans of also bagging Sherpa, Argonaut, Colchuck and Dragontail. 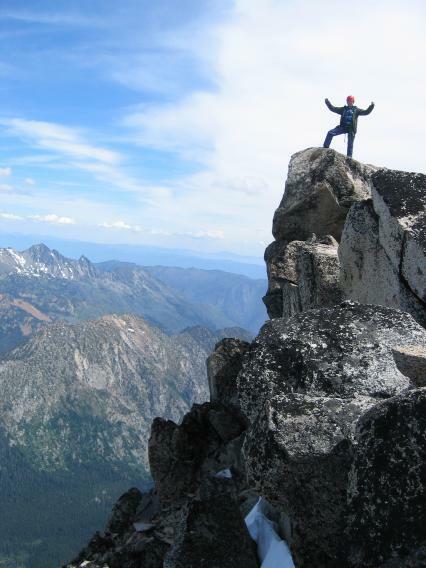 If we were to do the west ridge again, we would again choose fun rock over unaesthetic ledges. Although just maybe we'd look at the map when on trail. Maybe. Gear taken: 60m 9.4mm dry rope, rack of rock pro, rap slings, helmets, 1 ice axe each, 1 pair of crampons to be shared (unused), stove, water filter, tarp (for use as tent, no poles), warm clothes, food. Found gear, converted for use in a non-life-critical function. Some notes listing a summary of the pitches we climbed, and a partial timeline. A list of the food Ania brought.